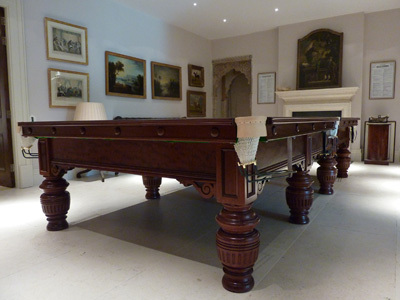 As well as manufacturing new tables, we offer a successful Snooker table restoration service for clients who wish to give their own tables a well earned makeover. In all full restoration instances your table will be returned looking and playing as new. On collection the table is dismantled and all components are labeled and boxed. Then we get to work on the woodwork by removing the old varnishes, paints and lacquers. Its off to the sanding dept to remove the knocks, scratches and years of abuse. One by one each component is brought back to life. Legs are fixed in the lathe, re-turned and sanded. The frame is re-sanded and the brass fixing's, Pocket plates, Rest holders are polished until they gleam again or are replaced with brand new fittings. After a final sanding its down to the Polishing shop for several coats of stain, Lacquer and polish. Meanwhile new pocket leathers are fitted and a new pure wool napped cloth is ordered. The cushions are Re-rubbered with the finest Northern Rubber and finishing to as new. Its now time to take it back to the owners for installation. Tables unless otherwise instructed are polished in the same style and finish intended by the original manufacturer. All genuine Snooker tables are very heavy indeed. This is mainly due to the slate bed. Even the 6ft versions are heavy and unless you are prepared to drop your table off at our factory two persons will need to call to collect it. Depending on your location this does have an impact on the price. Full restoration prices start from £725. With a full size table restoration including most mainland UK destinations, collection and installation being £1550. The full turn around time is usually between 3 - 6 weeks. Snooker tables come in a range of sizes from 5ft x 2.5ft to the full size 12ft x 6ft that we see in snooker halls and on TV. Some of our customers have rooms large enough to accommodate these full size tables. A full size snooker table slate bed usually manufactured in 5 pieces. Each piece can range from ¾” inch to 2” 1/18” thick which are assembled in a particular order. They are extremely heavy to manhandle and sometimes need 4 persons to carry just one. Each of these slate pieces have been drilled and doweled during the manufacturing process to fit together perfectly. 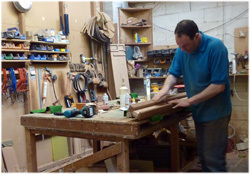 The whole bed is then precision ground to create one completely flat snooker table bed. Old style Snooker Dining tables are usually made with a one piece 1/2" slate bed so as to make it easier to manually lift the table top into a playing or dining height position. "1/2" slate is unavailable nowadays due to sagging at dimensions over 7ft. 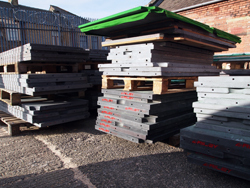 As a consequence new snooker and pool dining tables are now supplied with a thicker one piece 3/4" slate bed. This limits the size in which a dual height snooker dining table can be made. an 8ft 3/4" slate is too heavy to lift in a domestic environment. anything larger than 7ft are made as static height design"
On final assembly in the snooker room and once the table has been leveled, the joints in between the slates are filled with epoxy resin and once set are sanded smooth to leave a perfect join between each piece. Snooker and Pool table cloths. We use the Hainsworth Smart range of wool napped cloth for all but a few of our snooker table refurbishments and installations. This cloth above all has been chosen as the industry standard throughout the country. It's a very popular cloth that is found in most snooker clubs and private residences. Its is hard wearing, reliable and only requires replacement perhaps every 5 yrs even with regular use. Strachan 6811 has similar properties to the Hainsworth smart and can be ordered separately if desired. There are other specialist cloth choices however that can be ordered if required. According to our experienced table fitters ( All time severed with apprenticeships at Riley Snooker when the manufacturing base was here in Accrington and Padiham) Strachan Tournament & Hainsworth Match lasts around 12 months. Strachan Match and Hainsworth Precision lasts only a matter of weeks! These are all at least £100 extra on the price of any snooker table offered. Our American Pool tables are supplied in any of the colour's available within the Hainsworth Elite Pro cloth range. Again this is the industry standard and is durable enough even to be played outdoors. The upgrade in this instance is to the Simonis Cloth which is around £30 extra per table. Pro cup pool American pool Balls can be ordered for £125 extra. I am occasionally asked if we supply the brass rise and fall mechanism. We don't stock this item as each set is ordered as needed from our suppliers..
See what tables we have in at the moment by visiting our Refurbished table section EBay shop . New snooker cues and balls are supplied with every Refurbished table.